(c) Vernacular final exam in Urdu. Main Languages : Sanskrit, Hindi, English and Urdu. Taught in rural area of Haryana, the general knowledge of Astrology and Ayurveda. Searched and recorded various forms of art and folk art, particularly in Folk Songs, Folk Legends, Folk Drama, Swang, Jatra of Bengal, Bhawai of Gujrat and Naqal of Punjab, Folk talkes, Wall Paintings, Texts on Ancient Traditions & Social Customs of India. Study of Haryanvi, ‘Dakhini’ Hindi and standardisation of Devnagri Script. A special study of vowel ‘j’ & other vowels which has been sent for nobel prize by Lal Bahadur Shastri Sanskrit Vidyapeeth (Deemed University), New Delhi in 1992. Astrological studies are his most important contribution to the fund of world knowledge. And more than 100 research papers read in conferences and hundreds of articles published in various magazines. The awarded honoris causa degrees for these contributions are jyotish ratnakar of akhil bharatiya jyotish sammelan (lucknow) and jyotish bhaskar (doctorate degree) of poona. Invited to preside over all india conferences in jyotish and to read new research papers therein. Bhashavid degree was awarded by vishwa jyotish sammelan, new delhi, which has added a global dimension to his personality. Establishment of haryana lok manch in 1963. Served as director as well as secretary to this august organisation. It was successful in creating a cultural, political and historical revolution in Haryana. (2.) Coveted membership of ‘Sangeet Natak Academy’, a govt. of India Institute, was achieved and served with greatest possible sincerity, honourc and prestige. (3.) Membership of Akashwani, Rohtak wherein he served as Programme advisor. (4.) 300 one-act plays in Hindi Language. (5.) Eleven Novels in Hindi Language. (6.) Eight Books on Folk literature. (7.) One book on History of Haryana. (8.) Seven Collections of One-Act Plays are Published. (9.) Edited literary and astrological portions of Dr. Hazari Prasad Dwivedi Granthavali published by Raj Kamal Prakashan, Delhi. (1.) New interpretation of panini’s grammar. (2.) New phonetics as applied to vowels & consonants both. (5.) Astrology and the global phenomenon : Leaders of the world and their horoscopes. (7.) 27 Days Calendar: A new technique evolved for the panchanga system and the future predictions. (1.) First and foremost scholar of swang, folk-drama of Haryana. (2.) Supreme researcher of ancient traditions, fairs, festivals and social customs of India. (3.) An eminent liguistics innovator, who changed the history of indian grammar. (4.) Propagator of co-relation theory between Ayurveda and Jyotish and treatments evolved out of this synthesis, which has proved highly successful. (5.) 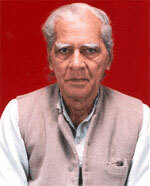 Worked for the development of hindi drama for ten years in akash vani, all india radio, new delhi from 1947 to 1957. (6.) Has to his credit the authorship of 300 one-avct plays and broadcasting them by All India Radio, New Delhi. (7.) Eleven published novels relate to social problems and development. Haryana government’s specialist on anthropology for ‘People of India’ project and anthropological survey of India. Research on the place of origin of aggrawal community, “Agroha” and has to his merit the publication of the book 'Agroha’ which is an acclaimed pioneer contribution. (12.) Reviewer of the mughal period of history of india through manuscripts belonging to the period of emperor auragzeb. (13.) Brought a cultural renaissance through haryana lok manch, which would remain an everlasting contribution to Indian art. (14.) A rajya sabha honour to him by Humayun Kabir, Minister of Education, govt. of India by referring as “ The Expert of Haryana” in 1958. (15.) An Editor, Translator, Pioneer, Crusader, Innovator, Who had a World Vision of Futurity, Prospects, development and prosperity combined with the knowledge of synthesis between medicine and astrology.